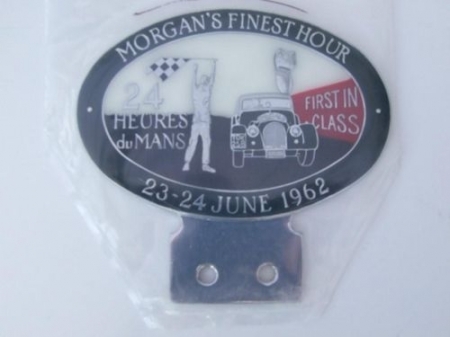 A Morgan Sports Car Club car badge in pressed steel with multi coloured enamels illustrating the class win at Le Mans and with 'Morgan's Finest Hour 23 - 24 June 1962' around the outside oval of the badge. This badge was issued in 2002. As new." I will be interested to see the actual price; shouldn't have long to wait as the auction was on the 25th and they usually post the results within the week. That would look good on an LM62, and if there were any Mog collectors there, the bids could easily get to �100 I reckon. I wish I'd have seen it before the auction was over as I'd have been tempted to put in a bid. It is a nice badge, but it is not an enamel badge. It is made of steel covered with a thin plastic layer which will detach and fall off. Then it becomes a relief badge which is different but still nice. That happened to mine and Melvyn refurbished it. Presumably someone (MSCC?) 'owns' the Dies for these rare badges. They were probably left with the original Badge Maker who, if found, may like to strike off a few more specials / Limited edition run of this one (and Keiths) for the 50th Anniversary. ?